Debt is the American song that we as a country just can’t stop singing. With a rising collective national debt that’s in the trillions of dollars, $15,609 in credit card debt per citizen and a personal student loan debt of $32,956, it seems that this is one hole that keeps growing bigger by the year. How many times have you seen those flashy ads on TV promising to erase all your debts if you just made three to four easy payments to some debt relief company? They’re everywhere; you hear them as you drive to work in your car, get calls from aggressive marketers day and night and even letters in the mail promising you a fresh, new start. Debt Relief – Too Good to be True? Debt relief is something that may sound too good to be true, but it’s so enticing that most of us wouldn’t think twice about picking up the phone and speaking to a person who will promise to wipe our slate clean. Debt consolidation and relief companies are your proverbial Venus fly traps; beautiful on the outside, but they’ll devour you live if you warm up to them. 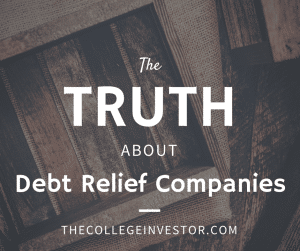 In this post, we’ll take a look at the truth behind debt relief companies and give you reasonable debt busting options that won’t leave you financially broke and emotionally frustrated. Debt relief companies rely on aggressive marketing strategies as well as preying on individuals who are on their last lifeline when it comes to their debt problems. They are aware that these people will do almost anything to get some kind of relief. They usually approach you with emotional sales pitches that would make even the Grinch’s heart soften up before slapping you with a contract that promises to help pay down your debt within a certain amount of time. Most of these companies may ask for a certain amount of money upfront to help facilitate the process, while others will ask you to open a bank account that you can use to deposit money which will go into paying off your debts. Debt relief companies are usually motivated by money, unless they are not-for-profit ones. This means that they will try to get as much money from you without actually solving your problem. For example, it’s common knowledge in the financial world that creditors look down on debt relief companies due to their unethical dealings; because of this, they refuse to work with them. However, debt relief companies won’t disclose this to you until after you’ve signed their contract. When this happens, you’re left with a plan that’s a complete dud since your debts can’t be negotiated with your creditors due to them not having a working relationship with your debt relief company. Another common misconception is what these companies actually do. For example, many label themselves: “Paperwork Processing Companies”. Meaning, they just fill out forms for you – no financial help, no following up on what you actually need help with. Most people who initially contact debt relief companies aren’t prudent enough to do some preliminary research; they are usually in such dire straits that they would sign off on an agreement in a heartbeat, not knowing that if the debt relief company consolidated their debts, they would be paying an exorbitant amount of interest that will eventually trump their collective interest amount pre-debt relief. We see this a lot in the comments of our Student Loan Scams post. At the same time, it would have taken them a much shorter amount of time to pay off their debts on their own terms compared to working with a debt relief company. It’s this kind of desperation and reactive thinking that these companies look out for and exploit to their benefit. Debt relief companies are also so good at telling half-truths that you’d be forgiven for thinking that they truly exist to help people like you and me. Most of the time, their ads only show the research and results that they choose to show to the public, and they’re only a small snapshot of a time when everything is going great. They are adept at cherry-picking information and then displaying this as the whole truth. For example, they might show you figures detailing how effective their program was at reducing a past customer’s credit for a period of 3 months. What they won’t disclose to you, however, is the exorbitant amount of interest that particular client will go on to pay for many years to come. This is not only unethical, it is dishonest and a sign of an entity that only cares about one thing – your hard-earned money. Debt relief companies may work when it comes to reducing or completely eliminating your debt by playing hard ball with your creditors. They may ask you not to pay attention to all the overdue notice and letters you receive, reassuring you that they have everything under control. They will then instruct you not to deal with your creditors and that they will personally deal with them. After a certain amount of time has passed, your debts may get marked down or written off, but at a hidden cost. Your creditor will pass on information to the credit bureaus that your credit was negotiated, and this will adversely affect your credit score. This will in turn raise your interest rates in the future, affecting your ability to get new cards, applying for a car loan, mortgage or even seeking to enter careers in certain fields. Debt relief companies won’t tell you this, but you can bet your last dollar that this information may be in your contract, written in ambiguous language that even the most astute of lawyers will have a problem figuring out. Working with debt relief companies won’t stop creditors from coming after you. This is because the whole process of debt repayment may take so long that they may decide to take legal action against you. Remember, just because you’re making more than minimum payments on you debt doesn’t mean that you’re scot free. Credit companies will start to pursue all collection avenues against you even when you’re shunting away money to a specialized account that your debt relief company asked you to open; this includes things like taking out a court order and seizing security in the form of your house, car and other valuables as well as garnishing your wages in order to try to get what’s theirs by any means necessary. If you DO decide to go with a debt relief company, there are a couple of things that you must be aware of in order to protect yourself. Read and review agreements, possibly with an attorney or debt counselor before signing off on anything. Realize that many of these companies want you to sign a power of attorney and give them the power of your finances. Ask the debt relief company if you will need to make a full up-front payment before having access to their services. This kind of over-commitment should be a red flag that you need to run away from this company. This is a big sign of a scam, especially with student loan debt companies. Ask if your payments will go to paying off your debts first or taking care of their fees. A good debt relief company will usually pay off your debts first before thinking about themselves. Remember this when considering student loan consolidation. Do your homework and check out the company’s ratings on the Better Business Bureau. Ask them if they have been registered by any financial body, and ask to see the proof of registration. If you can’t find anything online about them, that should be a red flag as well. Most of all, listen to your inner voice. If something just doesn’t feel right, don’t ignore your instincts. If you do, the fallout will be proof that you should’ve gone with your intuition from the get-go. Knowing all this information about debt relief companies, however, doesn’t really solve your problems. You’ve avoided getting yourself into a quagmire. Great. You must be thinking, “What can I do to help myself and finally be debt-free? In the paragraphs that follow, we’ll share with you practical and simple tips you can use to break free from debt. Most of us got into debt because of the pressure that exists in our society that makes it almost necessary to keep up with the Joneses. For others, spending money on status items seemed to fill a hole in our lives, albeit temporarily. You have to be honest with yourself and realize that true wealth and satisfaction doesn’t come from things; it comes from within. With time, you’ll be able to stop to think before making a purchase and this will help you ask all the right questions such as ‘do I really need this?’, ‘will this add value to my life lasting years down the line?’ and ‘what else can I buy that will be have a more permanent presence in my life?’. If you’re having a hard time understanding or applying this concept, think about buying experiences with loved ones instead of buying that new pair of designer heels; memories from experiences will last much longer than a retail purchase. Check out our tips on how to live a rich life if you need a place to start. Truth be told, it’s not hard to create your own debt repayment plan. Most people are usually so overwhelmed by the time they approach these companies that they would rather have someone else take the financial load off their backs than them having to deal with their irresponsible financial decisions. Sit down and look at all your debts, writing them down in order of the largest to the smallest amount. Alternatively, you can line them up in order of highest to lowest interest rate. Next, you may want to call your creditors, one after the other and try to negotiate a lower interest rate or asking for lower repayments on a monthly basis. You can also consider setting up an automatic debt repayment account that allocates money on a certain day of the month to your different debt sources. Conversely, you could adopt different manual debt repayment methods such as the snowball method that allows you to allocate a large amount of money to the debt with the highest interest rate, whittling it down until it’s gone and then moving to the next one and so on. Another thing you can do as you create your plan is to consider adopting a frugal lifestyle by cutting down on some of the things that you spend money on such as premium cable, Starbucks coffee, a magazine subscription and even driving to work (carpooling or taking the bus are options here). At the end of the day, you have the power to change your situation with a bit of creativity and a lot of initial discipline and willpower. Goals are like signposts that tell you you’re on the right path. Without them, you can drift through life without really achieving anything concrete. You can use goal-setting to tackle your debt situation slowly but surely. For example, you can manually pencil in a day a few months from today when you’ll have cleared more than 30 percent of your debt. If this sounds daunting, you can consider starting with micro goals that you know you can achieve without much effort; this will work if you’re not the patient type. In addition, you can reward yourself by asking a friend to throw a small debt freedom party once you get to a certain place in your goals so you have the motivation to keep going until you achieve debt freedom. Just make sure that these parties won’t cost a fortune! It’s so easy to make minimum payments because almost everyone and their grandmother can afford to do so. Paying only the minimum will have you paying your debt for years upon years which in the end might double the amount that you owed your creditor in the first place on account of all the interest you’ll be paying on your debt. Just hunker down and cut down on spending so you can have extra cash to pay increase your monthly debt repayment amount. Debt shouldn’t have to be the bane of your existence. We hope that this article has shed sufficient light on why you should rethink your decision to consider debt relief companies as well as what you can do to take back control and help yourself. Here’s to your success! It’s sad that most self-starting people can hash together a debt repayment plan that’s better than most companies set up to do just that for you. Good on you for exposing the scamsters!